Gary Collins wrote Living Off The Grid to bring people down to earth to the realities of living with less, making sacrifices, choosing your priorities wisely, and having a bucket of cash because buying into this lifestyle is not cheap. Very sensibly, he suggests buying a small RV, or at the very least renting one to live in while your off-grid home is built. Water is a top priority. By my estimation, Gary spent about $30,000 to sink his well. He was lucky enough to hit water on the first drilling. If he’d had to drill a second well, it would have cost that much again. Setting up a means of sustainable electricity is next. Gary provides a kilowatt formula for figuring out how much electricity you will be using and then adding, hopefully, two forms of electrical power to reach your kilowatt goal. Dishwasher? Hot water? TV? Computer? Refrigerator? Stove? You can provide yourself with as many amenities as you like, but you’ll have to power them, and you’ll have to pay initial fees to get them. Solar panels cost money and require maintenance and enough light to capture the necessary power. Can you afford to add some form of wind power? Not many people will live near enough to a stream to adapt some hydroelectricity. Rugged individualists have an appeal all their own. Gary Collins is devoted to his off-grid way of life. He runs a website about it, writes books about it, and answers people’s questions about it. 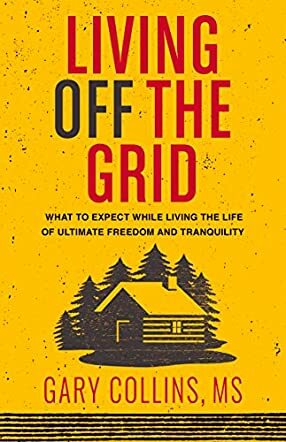 Living Off The Grid is a follow-up to his first book, Moving Off The Grid. The first book is about making the move, and this second book is a how-to manual for good planning and what to expect. A place to build should be thoughtfully chosen. How far away from people do you want to go? Or how close? Either way, the author suggests that you tap into the off-grid community, as they will understand your lifestyle and be a generous and helpful resource. I have to admit that I was expecting this book to be more about living like a subsistence farmer, hardscrabble farming the land, and following a team of oxen as they pull your manual plow. I was way off. Living Off The Grid is extremely entertaining, informative, and passionate. I enjoyed it very much.